More and more language classes are being given online in ‘digital’ classrooms, rather than in-person in a ‘face-to-face’ environment. Does this make a difference to how our students learn? And, importantly, which type of class do our learners prefer? According to our research, while students may have distinct opportunities for language practice and communication online and face-to-face, online classes can make a positive contribution to a student’s learning journey. Wall Street English students follow a blended learning method, first learning language through bite-sized interactive multimedia lessons, and then practising the language in small teacher-led classes called ‘Encounters’. The multimedia content can be accessed anywhere and from any device, but traditionally students have come into Wall Street English centres for their Encounters, booking a class at a time convenient to them. However, over the past two years, Chinese students have been given the option to attend these classes online in a ‘Digital Classroom’, allowing even greater flexibility and availability of class times. Online Encounters have proved popular, and approximately 35% of all Encounters in China are now held in the Digital Classroom. As we’ve discussed elsewhere, it can sometimes be a challenge to get students communicating in the digital classroom, so we expected to find a difference between the opportunities for student communication. However, when we compared our online and face-to-face teachers’ perception of the opportunities for practising the unit language, there was little perceived difference (see Figure 1), and while 55% of students reported having more opportunity to practice in in-person classes, encouragingly over 40% responded that they saw no difference between the opportunities offered for practising the unit language between in-person and online classes, a figure we can improve through further teacher training. Of course we know that it’s not only important for students to have the opportunity for controlled practice of the unit language, but also to be able to communicate more freely with other students. 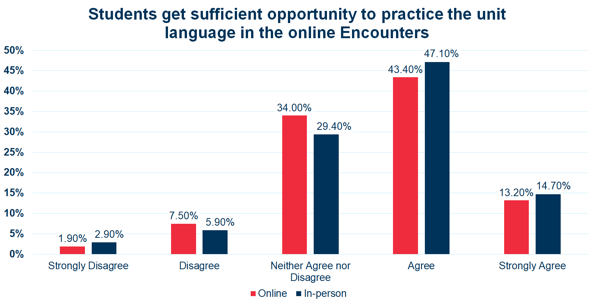 When we look at the results for the teacher perception for opportunities for freer speaking practice, there is a clear distinction between online and face-to-face teachers’ perceptions (see Figure 2). This is reflected in the student experience, with only 24% of students feeling that they get similar opportunities for talking freely with other students in online and in-person classes. Comparing face-to-face and online classes like-for-like, however, doesn’t give the full picture of what online classes have to offer. When we asked the main reason they chose to take classes online, 44% replied that it was because it was more convenient than always coming into a centre, and 46% because online classes gave them a wider availability of class times. By offering our students online classes, we increase the number of classes students can attend (and therefore the amount of speaking practice) helping them to progress more quickly. Responses from our students also highlighted other learning benefits for online classes. While overall our students valued the support and overall learning experience in the Wall Street centres, some recognised the benefits of online classes in terms of communicating with teachers and students with a wider range of accents and cultural experience, and from practising speaking in an online environment that mirrors the types of interactions that many of our students encounter in their working lives. When considering how effective online classrooms are, we should make sure we recognise the full range of opportunities that the digital classroom can offer our learners. Bindi Clements presented the findings from the study at the 2018 OLLReN Annual Online Conference ‘Research into Using Technology for Language Learning’ and at the 2018 TESOL Italy conference. You can view a recording of her presentation here, and the slides from her presentation here. *53 Online teachers, 34 in-person teachers, and 293 students responded to our survey. Bindi Clements PhD, is an EdTech specialist with extensive experience in learning design for language and professional skills training. Bindi joined Wall Street English in October 2017, and is responsible for instructional design development decisions, research into product efficacy, and ensuring quality and consistency of the instructional design of Wall Street English products. In her free time, she spends time with her children and plays trumpet in a Latin jazz band.